ANAHEIM, Calif.—Jeanine Tesori: The most successful-ever woman composer for Broadway. She wrote the score for Tony Award-winning Fun Home and Caroline, or Change, both of which I admired and loved. It was her name that brought me once again to brave the L.A. freeways to Chance Theater in Anaheim, some 50 miles from home, to see Violet (Feb. 25). 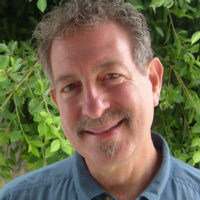 Violet was Tesori’s first musical, produced off-Broadway in 1997, was nominated for seven Drama Desk Awards including Outstanding New Musical and won the Drama Critics’ Circle Award for Best Musical, the Lucille Lortel Award for Outstanding Musical and a Special Obie Citation for the score. It reappeared on Broadway in 2014 in its original two-act version, but has since been tightened up to a fast-paced intermissionless hour and forty-five minutes. I felt exceptionally eager to hear it. Another reason I drove down to Orange County for this production was that its direction and choreography were in the hands of Kari Hayter, musical direction (of a band of four players) by Robyn Manion, scenic design by Fred Kinney, costume design by Elizabeth Cox, and dramaturg Sophie Cripe, the same team that lit up last year’s acclaimed minimal staging of Parade. Violet’s book and lyrics are by Brian Crawley, who based it on a story, “The Ugliest Pilgrim,” by Doris Betts. Set in the South and Midwest over the course of a compressed three days, September 4-6, 1964, Violet features a variegated cast of twelve and a musical palette that encompasses a number of genres—gospel, blues, rock, country, R&B and lullaby, as well as lyrical songs in the popular Broadway mold. The time frame delivers what it suggests: stirrings of fitful change during the early days of the civil rights movement, and the marked buildup of U.S. forces in Vietnam under Pres. Lyndon B. Johnson. Also well to keep in mind, the Civil Rights Act of 1964, signed on July 2, forbade discrimination based on race, color, religion, national origin and gender. Many historians have argued that the earliest and most immediate beneficiaries of the law were women. 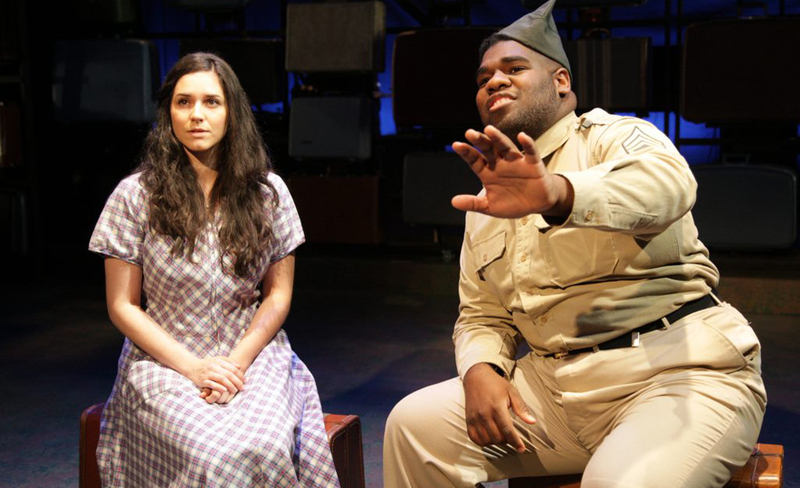 The musical tells the poignant story of a Hollywood-obsessed young woman from Spruce Pine, N.C., who was accidentally scarred on the face as a child when an axe blade flung loose. Hoping that a fiery evangelist in Tulsa whom she’s seen on TV can cure her, Violet embarks on a 900-mile-long bus ride through Memphis and Arkansas to Oklahoma. It’s basically a road trip where, along the way, she meets two young soldiers, one Black, one white, who teach her about love, courage and the true meaning of beauty. Although the encounter with the charlatan entertainer preacher leaves her disillusioned, he does give her some useful counsel. Three days may be too short a time in real life, or even in the theatre, for a mystical transformation to take place in a young person who seems practically incapable of functioning in society and whose disfigurement appears after a dozen years to be more psychological than physical. She has taken her wounds in life and spun them into a painfully sarcastic, suspicious, mean-spirited view of the world. But ultimate grace is the optimistic artistic conceit of the work, and best not put under the microscope of logic. The musical rewards are more than sufficient to leap over the viewer’s occasional twinges of disbelief. Although Tesori explores several standard genres in her music, she puts her own ID on them. About two-thirds through several of her songs in Violet, she unexpectedly introduces a new note not in the “chord” that raises the number to a fresh, unexplored place. 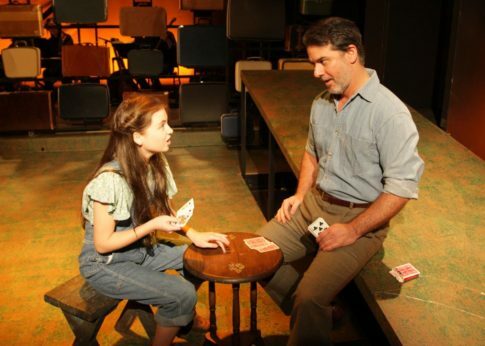 Both the subject matter of the songs and their staging are often distinctive: There’s one number called “Luck of the Draw,” in which on one side of the stage Violet’s father (Johnny Fletcher) is teaching the Young Violet (Rebeka Hoblik) how to play poker, while on the other, just a few feet away, the mature Violet (Monika Peña) is playing cards with her traveling companions, Flick (Taylor Fagins) and Monty (Jordan Schneider). It’s an intricate ensemble that brought to mind another card-dealing scene—the famous fortune-telling quintet from Carmen. It bears noting that just as there are two Violets in the show, the younger and the older, in Tesori’s Fun Home, based on Alison Bechdel’s autobiographical coming-out memoir, there are three Alisons—the mature one writing the book, the college-age Medium version first exploring her lesbianism, and the 10-year-old Small Alison. This theatrical gimmickry, relatively rare but not unknown, must have a special appeal for Tesori. The gospel number that opens the show, “Water in the Well,” which also refers to “honey in the bush,” foreshadows the whole story—that out of despair and hopelessnesss, our act of pilgrimage will yield sweetness and salvation. As the poker players sing, “Most things fall in line by the luck of the draw.” In the end, Violet is not the only one who is asking of the world that people take the trouble to “Look At Me,” and not just at one defining external characteristic such as a scar or a complexion. Violet is as much anti-racist and pro-woman as it is anti-looksist. The staging, like that of Parade last year, is simple yet elegant. On Broadway there was a physical Greyhound bus, but here the passengers sit on their luggage. We simply do not need all the hulky, bulky props we often imagine we do. The walls of the stage are similarly covered with period luggage such as Greyhound passengers might check through to their destination, implying that we all carry our baggage in life wherever we go—as one often reprised song says, “On My Way.” Quite likely the health, physical condition or the emotional lesions of the person sitting alongside her on the bus are fully as painful as Violet’s facial scar is to her. The Tulsa faith healing preacher (Chris Kerrigan) asks of his audience, “Are you on the way or in the way?” as he teaches that healing comes not from doctors and hospitals but from trust in Jesus. Given the dead-end of his cynical promises to the naïve and gullible, it would seem that it is he himself who is in the way of understanding and betterment. If it looks like Violet has slipped through the musical cracks, a production by the Actors Co-op in Hollywood has been announced for May 11-June 17. I’m pretty sure I will want to see what they do with this exciting piece of theatrical property. Violet has nary a sour note in it. The performance is thoroughly professional and inspiring. It plays through March 4, Thurs. at 7:30 pm, Fri., and Sat. at 8 pm, Sat. and Sun. at 3 pm. Chance Theater is located at 5522 E. La Palma Ave., Anaheim, CA 92807. For tickets and other information call (888) 455-4212 or visit the Chance website.